Jesus gave the great commission as a guide for the church's ministry. "Go therefore and make disciples of all nations, baptizing them in the name of the Father, the Son, and the Holy Spirit, teaching them to observe all that I have commanded you; and lo, I am with you always, even to the close of the age" (Matthew 28:19-20). Today we continue to preach the good news about Jesus and teach His disciples God's word. The pastor gives direction and oversight in equipping members to serve according to their spiritual gifts. We want to be God's redemptive community, working together in love and fellowship as the Holy Spirit guides us to do His will. 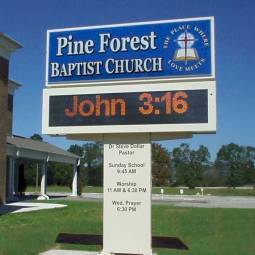 Those seeking a church home could not make a better choice than Pine Forest. I invite you to become part of this church family as we worship, study, pray and reach out to others. We care about you and want to minister to your needs as we all grow in love and understanding of God's plan. Become a part of what God is doing at The Place Where Love Meets! Simply come forward during the invitation time at the end of any worship service to speak with a minister. Profession of Faith: This means you have trusted Christ as your Lord and Savior. The church will vote to accept you as a candidate for baptism. The pastor will counsel with you, give you training in discipleship, and baptize you by immersion. Joining by Letter: This means you are a member of another Baptist church, and wish to transfer your membership to this church. The pastor will talk with you about your conversion experience and beliefs, and present you to this church for acceptance as a member. Joining by Statement: If you are a Christian who has been baptized in a Baptist church which cannot send your letter, you may come as a candidate for membership by Statement. The pastor will talk with you about your conversion experience, former church membership and beliefs. He may then present you to this church for acceptance as a member by statement of your former membership. "Lord Jesus, I turn away from my sins and ask your forgiveness. Take complete control of my life. Thank you for doing what you promised. Amen." When the pastor gives an invitation (usually at the close of worship services), you may step forward to tell him of your decision. After your decision, following Christ in baptism is a testimony to others that you have died to sin and have been raised to new life. Church membership brings opportunities for Bible study, fellowship, encouragement and service. Jesus gave no limits to the great commission! Until He returns, we must keep preaching and teaching God's word. We can never stop visiting the sick, caring for the needy and making disciples. Wherever your talents and gifts may be, there is a place for you at Pine Forest Baptist Church. Following a vision has led us in 60 years from a brush arbor to a beautiful and innovative worship center. Now, led by our dedicated pastor and a gifted staff, we are asking God to expand that vision into this new century. God's unchanging message must be proclaimed to every new generation in the most effective way. We invite you to share the vision as we work to make the church of tomorrow a reality today! Every week brings opportunities for youth activities, Bible study, prayer groups, sports, crafts, fellowship, dinners, mission studies, music groups and senior adult activities.